Akbar's Bridge, Srinugger, Cashmere [sic Srinagar, Kashmir]. bl.uk > Online Gallery Home	> Online exhibitions	> Asia, Pacific and Africa Collections	> Akbar's Bridge, Srinugger, Cashmere [sic Srinagar, Kashmir]. This photograph was taken by Samuel Bourne in the 1860s for an album entitled 'Photographs of India and Overland Route'. 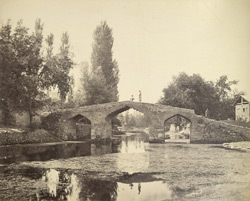 It shows a masonry bridge in the Kashmiri city of Srinagar attributed to the patronage of the Mughal emperor Akbar (r. 1556-1605). Natural lakes, picturesque canals and narrow lanes winding amongst old timber houses typify the urban environment in Srinagar. The city was a favourite of the Mughal Emperors as it was a cool and refreshing to the heat of the north Indian plains from where they ruled. They further enhanced the surroundings by planting beautiful gardens with stepped terraces and flowing watercourses.